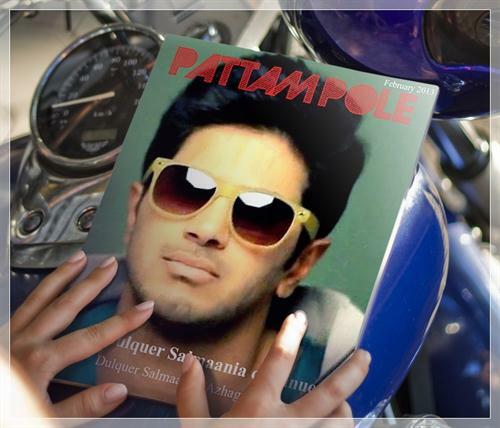 Pattam Pole malayalam movie starring Dulquer Salmaan in lead role will be cinematographer Azhagappan's directorial debut. Scripted by Anoop Menon, Pattam Pole will be centered upon a theme embedded with romance and comedy. The movie will go on floor after the script works finish at the end of 2013. How can one describe the moment when a popular young actor joins hands with a successful scriptwriter for a new movie? It would add more excitement when known that the project would be helmed by Dulquer Salmaan and Anoop Menon. Tiled as 'Pattom Pole' this movie will be centered upon a theme with flovours of romance and comedy combined together. After getting high regard as a script writer, it would be for the first time Anoop penning the script without including Jayasurya in the venture. The script of the movie will be finished at the end of 2013 and later it would go on floor. The heroine and other major characters of the movie are yet to decide. This new combination would surely be a talk in the town while Anoop would be getting a chance to work with Dulquer, son of Mammootty whom he considers to be his best critic. During a recent award function Anoop praised Mammootty with words of gratitude for giving suggestions and analyzing each movie critically. Anoop who is also known for his splendid acting likes to give preference to script writing in 2013. It is known that Anoop wishes to try his skill over director giving clues of his active presence behind and in front of the scenes for David and Goliath assisting Rajiv Nath. He is expected to don the role of direction next year. As an actor Anoop was a part of 10 malayalam movies in 2012. He already had committed a handful of projects in 2013 including Buddy, Hotel California, Lavendar, David and Goliath etc. As a screenwriter, Anoop went up the ladder of success with penning the dialogues for Cocktail. He has also lent his hands for the script works of beautiful, Trivandrum Lodge, David and Goliath. On the other side Dulquer Salmaan who pooled into the film industry with Second Show proved to keep the pace getting rich movies to prove his acting skill. Usthad Hotel and Theevram were his next ventures which too got positive response from theatres. Dulquer has recently completed with works of Martin Prakkat's ABCD: American-Born Confused Desi which would reach theatres in March. He will soon join the sets of 'Neelakasham Pachakadal Chuvanna Bhoomi' and 'Anju Sundarikal'. Pattam Pole would also mark the directorial debut of cinematographer Azhagappan, who has been part of much-admired films during the past. His recent movies include Arike and Ozhimuri. The year 2012 celebrates in India the Centenary of Indian Cinema. It was a 100 years ago the first Indian film “Raja Harishchandra” was made by the métier of Indian cinema, none other than Dhundiraj Govind Phalke, better known as The Father Of Indian Cinema.Even though Indian Cinema bloomed in 1912 it took time for the movement to reach the South to hit the Malayalam screens. This article is an earnest endeavor to cobble up into a brief article the birth and development of Malayalam Cinema. Remya Nambeeshan gearing up for a Hollywood debut? Remya Nambeeshan who is getting positive reviews about her romantic-thriller Pizza, through the grapevine known is that the movie is making a Hollywood outing. If so, Remya Nambeeshan would become the first malayalam actress to get featured in a Hollywood movie. Even though talks about the English version are flying around, Pizza is making a real hunt getting huge response from the audience. Janani Iyer, a budding actress in south India is playing the lead heroine in Sugeeth's next malayalam movie 3 Dots. Being much popular among television viewers, Janani had been a part of more than 10 television advertisements before making a safe landing in Avan Ivan opposite to Vishal. It would be challenging time for Janani to create a space in malayalam which is truly dominated by Kerala born actresses. Read more to know about Janani Iyer. 3 Dots Malayalam movie preview is given here. After the majestic success of Ordinary, director Sugeeth is back with another tale which features lucky pair Kunchacko Boban and Biju Menon in lead along with Pradap Pothen, Narain, Janani Iyer, Aishwarya Devan and SreeDhanya in other leading characters. Read more to know about 3 Dots. Rachana Narayanankutty popularly known for her active appearance in offbeat comedy 'Marimayam' will be seen as heroine to Jayaram in upcoming malayalam movie Lucky Star. Rachana has already found a permanent place in the hearts of malayali audience with her unique style of talk and ever-loving smile. It would be her fourth regular assignment after Theerthadanam, Amen and '101 Chodyangal. Read more to know about Rachana Narayanankutty.